In the Shipping Methods table, you can see all the important information about available shipping methods. Click the title to edit the shipping method. If you want to create a new shipping method, simply click Add New button (the one next to the section title). Enable/Disable - enable or disable this method. Method Title – the title that users will see during checkout. Method Description - add method description. It will be under Method Title during checkout. Free shipping requires - select method for calculation free shipping. You can apply WooCommerce core coupons. Free Shipping - enter the total from which this shipping method is free, this will override the rules configured below if the order total is reached. Free Shipping Label - enter a custom label for free shipping eg. Free. Free shipping doesn't have a label since WooCommerce 2.6. PRO Maximum Cost - enter the maximum cost for this shipping method. If the cost based on the rules is higher, this maximum will be used instead. Calculation Method - choose rules calculation method. Defaults to Sum. Sum - all rules that match will be summed. PRO Lowest cost - only the lowest cost of matching rules will be applied. PRO Highest cost - only the highest cost of matching rules will be applied. Visibility - check to show this shipping method only for logged in users. Default - check to make this shipping method default during checkout. Integration - integrations are available as FS Connect services and as a DPD UK plugin. Service - if you use the above integrations, select the service you want to integrate. PRO Export - lets you save selected shipping methods to CSV file. You can create a backup of shipping methods or easily move it to another shop. Select shipping methods and click Export selected. Import - to import CSV file with shipping methods configuration click Import, next add CSV file and click again Import. If everything is correct shipping methods will be saved. If data in CSV file will be incorrect then you see info what is wrong in which row. If a shipping class specified in the CSV file is not found in the store it will be created during the import process. 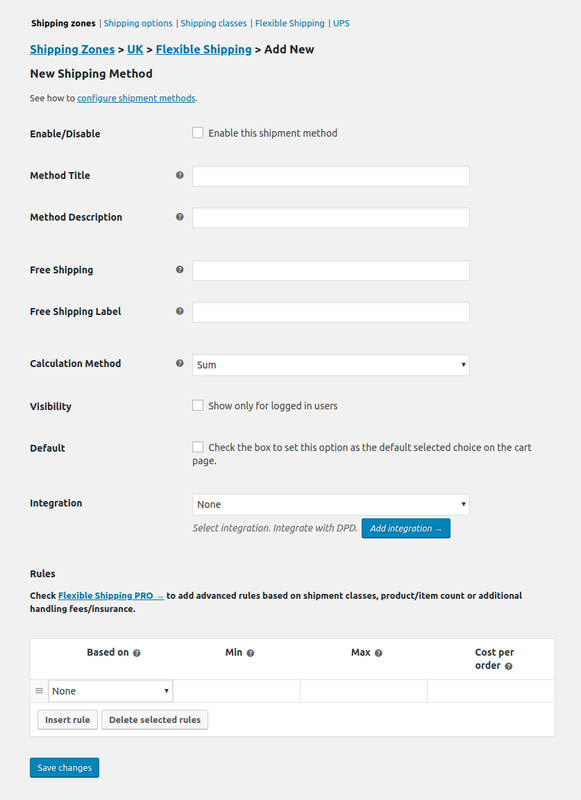 You can add unlimited rules to a shipping method by clicking Insert rule button. Calculations are made in the order of rule in the table. Drag & drop rules to change the order of calculations. Based on - select what the rule is based on. None - select for a fixed fee. Price - based on cart total. If a shipping class is assigned to this rule cart total will apply only to products from this class. Weight - based on the total weight of the cart contents. PRO Cart line item - based on the number of cart line items. Min / Max - enter a range for a 'based on' parameter. The shipping cost will be calculated for this range. Leave empty for any value. Cost per order - enter a cost for the rule. PRO Additional cost - enter an additional cost per Value field. PRO Value - enter the value for Based on condition. Additional cost will be calculated for every beginning value. By entering "1" an additional cost will be added for every dollar (or other currency in your store), item, kg (or other weight value in your store) or cart line item. For a rule based on Item entering "5" will add additional cost for every beginning of 5 items. PRO Shipping class - which products or shipping classes the rule applies to. All products - for all products with or without a shipping class. None - for all products without a shipping class. Any class (must be set) - for products with any selected class. Select class - select one or more shipping classes. PRO Stop - check to stop calculating the following rules if this rule is matched. PRO Cancel - check to disable this shipping method in the checkout when the rule is matched.